You guys, get ready to party. Sopapilla style. All of the sudden I had this idea to make mini cinnamon pancakes, and decided to execute last weekend. 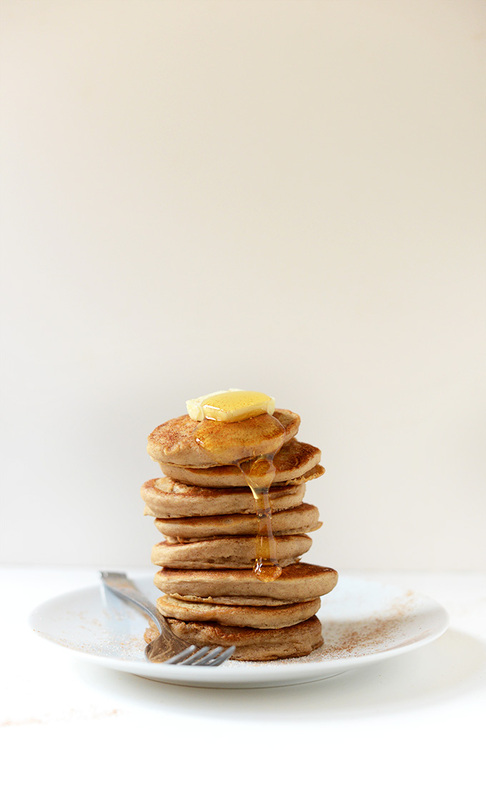 Pancakes + cinnamon = happiness, I was convinced. I wanted to make them vegan, of course, and although I was half-tempted to make them gluten free, I was really really in the mood for something familiar, and fluffy. So out the window that idea went. I can only do so much accommodating in the pancake department. Breakfast is serious business, after all. These cakes are dreamy. The batter is thick and light and they cook up all soft and fluffy, golden brown, and bursting with cinnamon aroma. I was keeping my stack warm in the oven while the rest finished cooking and each time I opened the door I got hit with an intense cinnamon donut scent – just like a sopapilla! That’s when it dawned on me: These are no ordinary cinnamon pancakes, they are fluffy and sweet and doughy just like a sopapilla, begging to be doused in honey. So that’s what I did. I don’t argue with the breakfast gods when they make such a clear request. These pancakes are PHENOMENAL. I know I could say this every time I make pancakes, but these are seriously some of my favorite to date! But really, if it’s just you and you’re dying for a sopapilla but don’t want to fry anything, this will satisfy that craving. 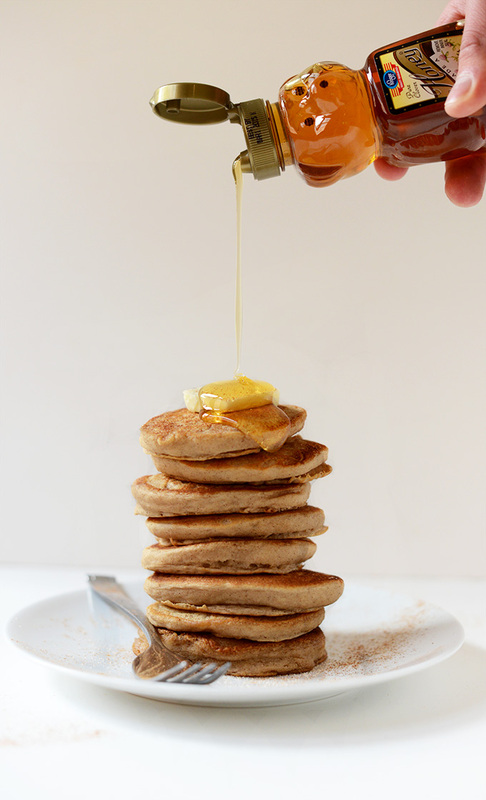 There’s practically no Mexican dessert desire that these little super fluffy cinnamon pancakes doused with butter + honey can’t fulfill. Take less than 30 minutes from start to finish. Require 1 bowl, 1 measuring cup + a whisk. Taste just like a sopapilla. 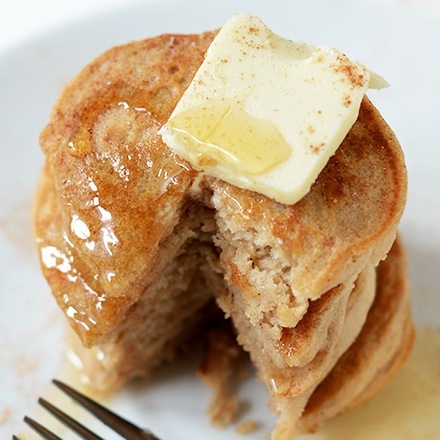 Are light, fluffy, and bursting with cinnamon flavor. Pair perfectly with a hot cup of coffee. What more do you need to know? Get to pancaking! Note: These cakes are vegan friendly if you top with maple syrup instead of honey. 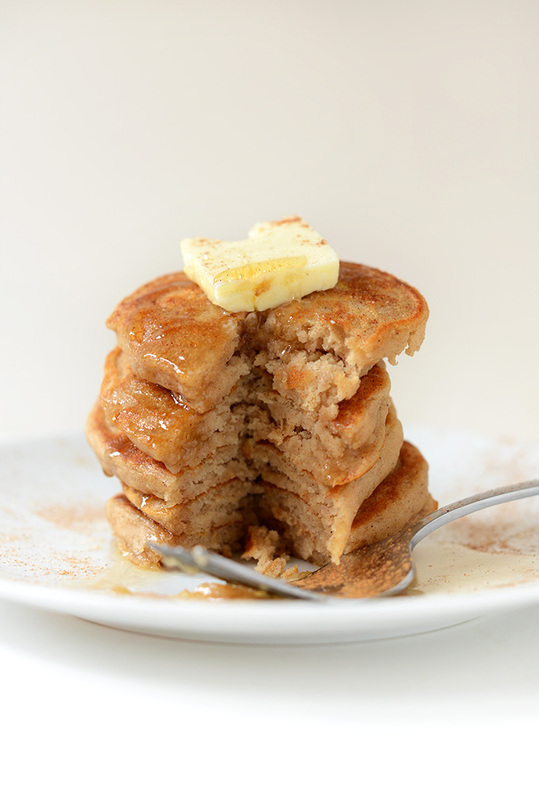 Fluffy cinnamon-scented pancakes that are both dairy- and egg-free. Topped with cinnamon-sugar, butter, and a little honey, these taste JUST like a sopapilla, only no frying required. Measure out milk in a large liquid measuring cup. Then add vanilla and melted butter and whisk. 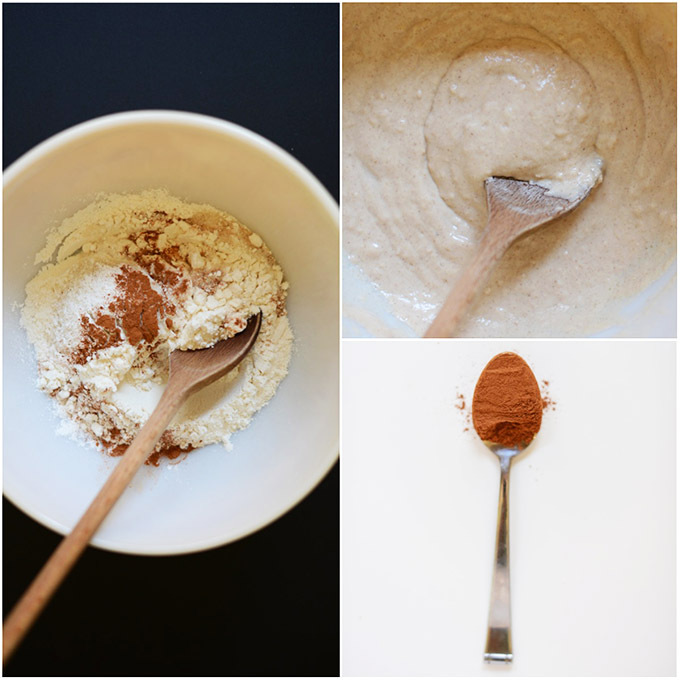 Add wet to dry and gently, slowly whisk until just combined. Small lumps are fine - don't overmix. Let set for 5 minutes while you preheat your griddle to medium-low heat. You want it warm but not screaming hot - definitely on the low-side of medium. Once hot scoop scant 1/4 cup measurements onto a griddle or pan lightly greased with non-stick spray. Should make ~10 pancakes (as original recipe is written). Flip when bubbles appear on top - 2-3 minutes. Cook for another 2 more minutes on the other side. Place on a large plate and keep warm in a 200-degree F (93 C) oven until ready for serving. 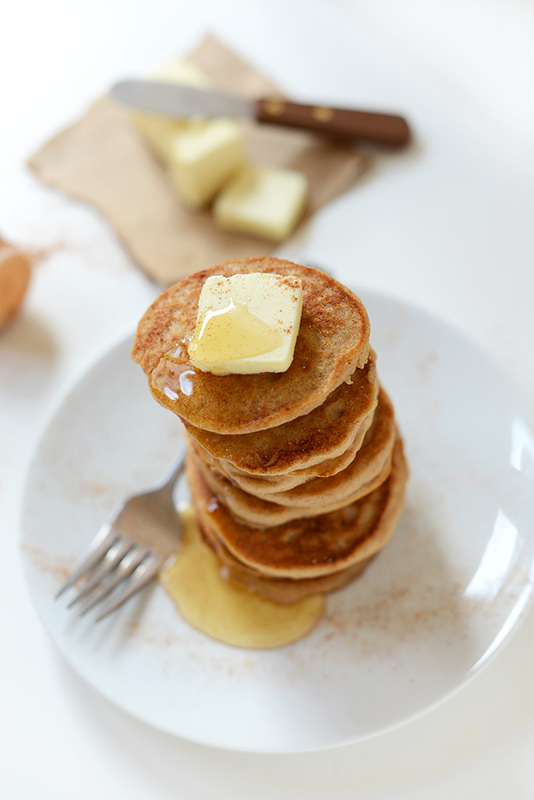 Top with butter, cinnamon sugar, and a drizzle of warm maple syrup or honey. I went with honey because it's what I had on hand + it made it like a true sopapilla experience. But if vegan, agave or maple syrup will do fine. Store leftovers in an airtight container or bag in the fridge to keep fresh, or the freezer for longterm storage. However, these are best when fresh. *This recipe is vegan besides the honey, which I highly recommend using to get the true sopapilla effect. However, if vegan simply sub agave or maple syrup instead. I made these with coconut milk (Chaokoh brand is the best) and they were AMAZING! Delish!! I used 1/2 ww pastry flour and 1/2 all purpose. Not as fluffy as in your pics but seriously yummy. i’ll Definitely make these again. Love that you use everyday ingredients. So easy! Thank you! Still making these three years later ????? 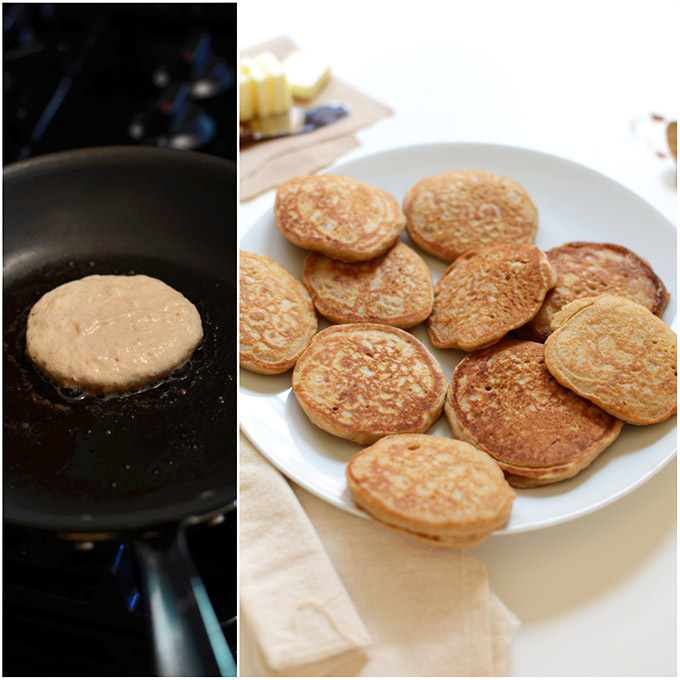 I love these pancakes – we make them every week and I freeze for my kiddos to munch on for breakfast throughout the week. I do add quite a bit more almond milk into the recipe and find that helps me make a thinner mixture, but pancakes still come out fluffy. Reheat beautifully as well! These are the best pancakes I have ever made/eaten. Every omnivore I have made them for asks for the recipe. I add a little more milk because I like them thinner, but the fluffy pillows of delicious the recipe results in are incredible too. Hi I was just wondering if I freeze these for later how do I reheat them? I’ve made them several times and love them but never thought to freeze them. Would I just reheat them in the oven? Hi Gabrielle! Thanks for reaching out. You can either reheat them in the oven, or you can even just pop them in the toaster and toast them if you’re in a pinch for time. A-M-A-Z-I-N-G! I’m breastfeeding and my baby is allergic to most foods and my normally vegetarian self was forced to become a vegan plus no soy. I’m never ever ever going back. Thank you minimalist baker! Just made these for my family, they all love them. We ate them with fresh strawberries and honey. Thank you for another wonderful vegan option. I have now made this recipe over a dozen times and also jarred the dry ingredients to give to relatives as Christmas presents. They are the best consistency for vegan pancakes! Fluffy and not dense or moist. If you add new vegan butter into the pan before each round of pancakes they get this beautiful crispiness on the edges from the butter. You wouldn’t believe they are vegan. You did it again Dana! These were absolutely delicious! I went a little less on the flour so I could add protein powder, and once I lowered the heat on the stove, they fluffed up so nicely! Okay, these were freaking amazing. I added some chocolate chips and DEMOLISHED these pancakes for breakfast. The recipe was so easy that I think I’ve already memorized it so I can make these every weekend! These look delicious and I can’t wait to try them! I do have a question though.. To lessen the carbs, would you recommend using almond or coconut flour as a sub? I’m afraid coconut may make it too dry. I made these tonight and they turned out amazing. My only question would be, could I half the sugar and would they turn out correct? I tried this recipe today and it was wonderful! When the batter was in the frying pan I added a few blueberries and some chopped walnuts. And I topped it with some more vegan butter as well as a drizzle of agave. It turned out absolutely splendid! hi i don’t know why but my always turn out flat and not that great. they taste fine but every “fluffy” pancake recipe i’ve tried turns out flat and horrible, including these. any suggestions? Hmm, overmixing? Or perhaps your baking powder is expired? flour is new. ooh maybe overmixing, is it supposed to be pretty lumpy? These are by far the BEST vegan pancakes we have ever had! Even my 13 year old son (who is very picky) loved them. This is definitely my new go-to pancake recipe! Thank you so much! Can I add unsweetened original almond milk, instead of vanilla? I make something very similar to this recipe. 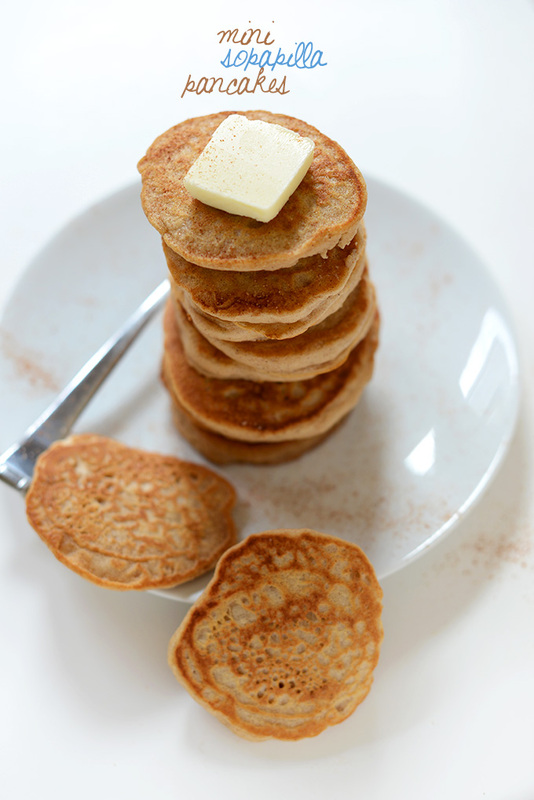 I use white whole wheat, soymilk, and replace the ‘butter’ with mashed banana. They are SO good! My mother, who is not vegan, loved them! Made these for a brunch party and every one ravedddddd! I skipped the cinnamon and did confetti sprinkles for a funfetti effect. I also made a brandy infused maple syrup so that upped the rating even more. Knew I could count on you! Thanks! Hi Dana, thanks for this recipe. The pancakes were super! I used King Arthur white whole wheat flour and only had regular almond milk, so I added an extra tsp. vanilla. My husband and I had a delightful Sunday breakfast (these cakes and soy sausage patties). Thanks again. This is honestly the BEST vegan pancake recipe I have ever made! (and I’ve tried soooo many) They are fluffy and buttery just like the non vegan pancakes I grew up eating. Even my non vegan mom loved them!! Thank you!! I made this recipe for breakfast! It was wonderful thank you. The changes I made were to use half Kamut flour and half whole wheat pastry. Only because I wanted to use up the Kamut flour. I had regular unsweetened almond milk not vanilla unsweetened. And it was still delicious! I used a full 1/4c of batter to make the pancakes so I got 8 mini pancakes. just made them with bob red mill gluten free pastry flour, they turn out just fine, fluffy, delicious, kids ask for more! thank you Dana for another perfect simple recipe :) this one made my day! PS I used coconut oil to fry them. It s a hit for the taste bud! Another great recipe Minimalist Baker, looking forward to the cookbook! Great news! thanks for sharing, Meg! I just made these with Bob’s Red Mill Gluten Free flour and they were awesome. The best pancakes I’ve had since not being able to eat wheat or eggs. Thank you! Oh and I added apples because I love apple and cinnamon together for breakfast. I just made these this morning with TJ’s GF all purpose flour. They were a little runny so they weren’t “mini” or very fluffy but nonetheless DELICIOUS! I haven’t had a sopapilla in years and this tasted just like one :) Thanks so much! I’ve never had sopapillas, but these tasted just like fluffy little snickerdoodles! 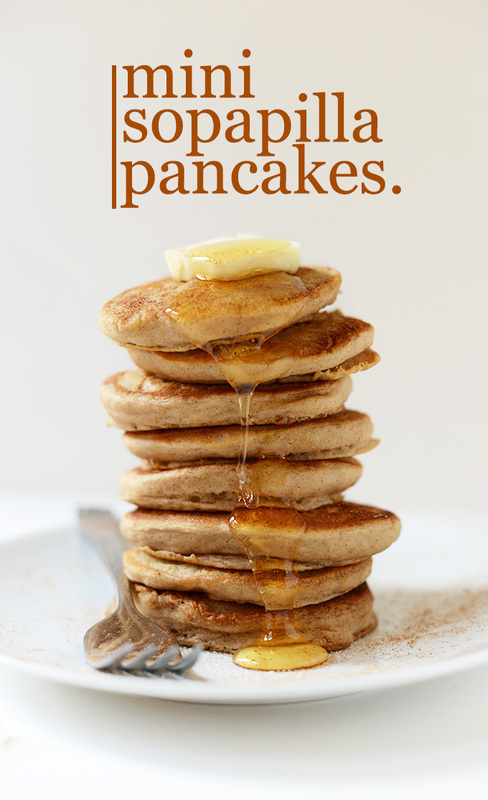 Love your pancake recipes! I made these for dinner tonight. They were a huge hit! While we are not a gimme type of family, my teen and preteen said they should be renamed Gimme Mores =) So thankful I found this on Pinterest! I can’t wait to try more and see if they pass my picky, always hungry kid tests! Question: What’s a scant TBSP? Thanks! Scant means a little bit less than the proposed measurement. So a scant TBSP is a little bit less than one Tablespoon. Hope that helps! Ah, thank you! Love your blog btw! Glad you enjoyed these, Katie! The cinnamon can be overwhelming for some, so feel free to pull it back next time! Thanks for sharing. haha, I need to change the note in that! It “serves” 10 pancakes, which is about 2-3 people. Glad you enjoyed them! Looks and sounds delicious. One question. Could you substitute coconut oil for the butter? I think so, but it will affect the flavor. Hope that helps! Ha! Unfortunate swap with the baking soda. Glad you liked them the second time, though! 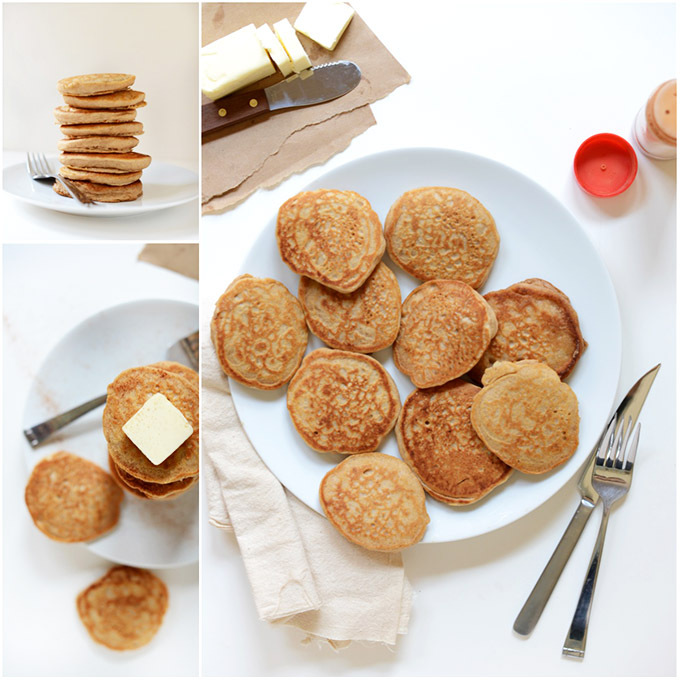 My search for egg-free and dairy-free edible pancakes is over! My son, allergic to all the above (+nuts) immediately asked me if I could make them again! I don’t have to make 2 different batches of batter anymore. Thanks so much! Oh my goodness…..it should be sinful to have dessert for breakfast! It was a unanimous vote that these babies tasted like snickerdoodles! I awakened this morning with the intent of making your pb flax pancakes but then I checked my emails and saw the smore pancakes (we have been eating smores like crazy lately) but didn’t feel like taking the extra steps and then saw the sopapilla recipe. It was up to my four yr old to decide, pb chocolate chip pancakes or cinnamon pancakes and he chose the winner and winner they were! Slathered with earth balance and sprinkled with cinnamon sugar then drizzled with honey and we were in sweet heaven! I do have to agree with everyone else(at my breakfast table) that these were like big stacks of fluffy snickerdoodles!! And I will totally be making these again and again!!!! Thank you! Yum! I wanted to let you know that I featured this today in my “What I Bookmarked This Week” post – stop by and see! Oh wow, definitely making these soon! I love cinnamon on pretty much everything. These look amazing!! I may just have to try these tomorrow! haha, I wish! If you lived in Wichita, maybe…. Anytime you want to donut-ify any baked good is fine by me. Everything is better when donutted. I’ve never heard of sopapilla before- what is it? The pancakes look delicious anyhow!! ooooowee these look so good!! Sopapillas are the bomb, but they’re not very easy to make and aren’t exactly healthy. These are the perfect compromise. They look so fluffy too! These pancakes look fantastic! Cinnamon and honey? I’m there! these look a-ma-zing omg. fatty fluffy pancakes = love. omg these are so cute and look SO tasty. You are the master of pancakes! Mini things are so much fun! Plus there aren’t any calories in anything smaller than the palm of your hand, right? Gorgeous! Loving all the cinnamon and your shot are so perfect. I love every sigle on one! 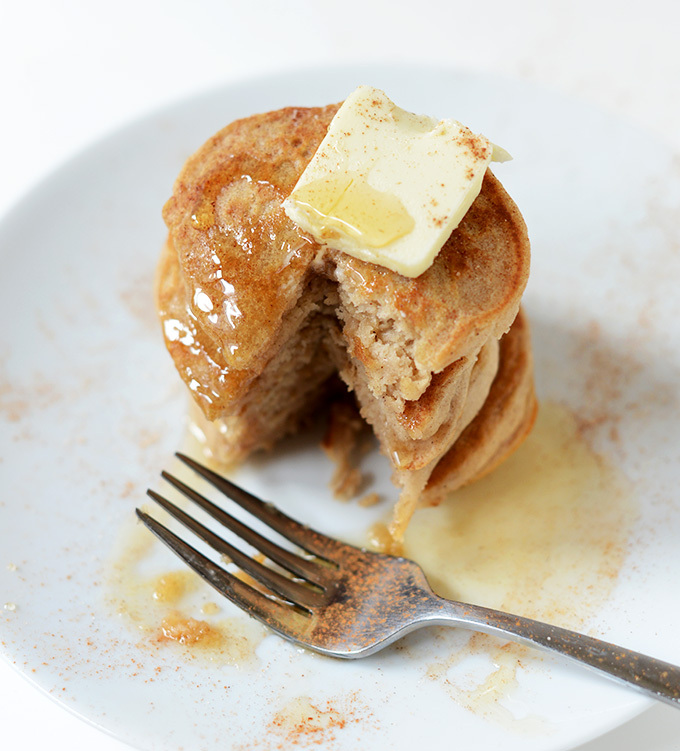 I love all that cinnamon in there – it’s such a fabulous spice! These sound awesome!